Crawley Town head coach Gabriele Cioffi admitted their 2-0 win against Cambridge United was 'a game of two halves'. Reds defended wave after wave of attacks in the first half and only managed one shot themselves in the opening 45 minutes. 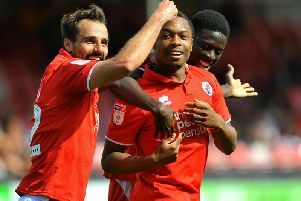 However in the second half Crawley gradually established themselves in the game before Luke Gambin and Ollie Palmer scored twice in a seven-minute spell around the 70-minute mark. The Crawley boss revealed they did not play their best in the first half and ended up running around without real purpose. Cioffi said: "It was a game of two halves; in the first half we started well we played for ten or 15 minutes of good football but then we started to play their game. "We lost a bit of confidence and we finished the half lucky to still be 0-0. "Then we were able to correct the mistakes and it wasn't easy to correct from the bench I was asking them to do something we had never worked (in training). "I was expecting them to play 4-3-3 like they did in their last game rather than the diamond, which is what they played. "At half-time I asked them to exploit more the right side, to play easy football in midfield, to play in a direct way. We have to breath with the ball. "We say in Italy: 'It's a dog which is biting its tale' because if you run too much you are not lucid in your mind so you lose something. "There were a couple of mistakes where we ran too much or we played too much."